The Christian faith “is under fire” and the law must be changed to protect religious convictions, a rally in support of the Ashers Baking Company has heard. Around 500 people were at Craigavon Civic Centre on Monday night - less than two days before a court in Belfast hears the company’s appeal against a ruling that it illegally discriminated against a gay customer. 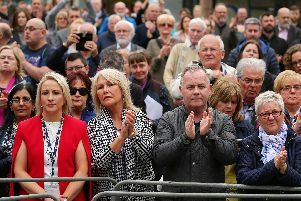 Simon Calvert of the Christian Institute told last night’s gathering: “Something has gone wrong, when good people like the McArthurs are being hauled before the courts just for holding to that simple view. He said: “We all know that people who believe, as a matter of conviction, that real marriage can only take place between a man and a woman, those people will face unreasonable hostility and unfair treatment sometimes in the workplace and elsewhere. Mr Calvert highlighted a number of cases in England where the Institute had supported Christians who had fallen foul of equality legislation or unsympathetic employers - including Peter and Hazelmary Bull who refused to allow two gay men to share a bed at their Cornwall B&B in 2008. Another case referred to by the Institute’s deputy director was that of Rev Brian Ross, a police chaplain in Scotland who lost his position after voicing support for traditional marriage in a totally reasonable way on his own personal blog. “Whether it is a baker or a B&B, there ought to be room for their beliefs on the rare occasions when doing what the customer wants would force them into a genuine and serious moral compromise. In those circumstances the law must respect their freedom of belief,” he said. Mr Calvert added: “People who disagree with the McArthurs who would still defend their freedom. Some of you will have read or heard on the radio that the gay rights activist Peter Tatchell has changed his mind, having previously opposed Ashers’ freedom, he know supports it. Protest organiser Daniel May told the News Letter that the Peter Tatchell U-turn on the issue would not weaken their resolve to demand action to combat discrimination. “When I read about the [Ashers’ support] meeting at first I thought it must be a bit of a wind up,” he said. “It annoys me that people still want to support something like that. I thought this had all passed. But if the case has done anything, it has made people think about their legal obligations when providing services and that is a good thing,” Mr May added. Speaking immediately following the court’s ruling last May. Mr McArthur said: “We’re extremely disappointed with the judgment. We’ve said from the start that our issue was with the message on the cake, not the customer, and we didn’t know what the sexual orientation of Mr Lee was, and it wasn’t relevant either. “We’ve always been happy to serve any customers that come into our shops. The ruling suggests that all business owners will have to be willing to promote any cause or campaign no matter how much they disagree with it. Or as the Equality Commission has suggested, they should perhaps just close down, and that can’t be right.